It’s early 1943. Hitler’s Germany and Stalin’s Russia are in a bitter struggle for their very survival. 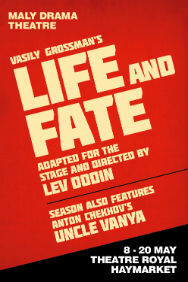 Life and Fate is a sweeping panorama of Soviet Society, an epic tale of a country told through the fate of a single Jewish family, the Shtrum’s. Vasily Grossman’s celebrated novel, banned because of the parallels it drew between Nazism and Soviet Communism, is being adapted for the stage for the very first time. From Nazi concentration camps to the Gulags of Siberia and the Soviet nuclear programme, the battle of Stalingrad looms large as the characters work out their destinies in a world torn by ideological tyranny and war. Please note: This is performed in Russian with English surtitles.